Deliciously soft and easy red velvet sugar cookie bars with a rich cream cheese frosting makes a festive treat for Valentine’s Day. After a month of green smoothies and healthier eats, I’ve started playing around with chocolate, anything heart-shaped and of course – red velvet in my kitchen again. With Valentine’s Day in less than two weeks, you’re probably seeing a ton of festive and cute things everywhere you look. So if you’re looking for a few ideas on what to make for that special day, I’ve got some delicious Red Velvet Sugar Cookie Bars to help get you started. The bars are soft and thick and really easy to make since you won’t have to roll out any dough. They are topped with a sweet cream cheese frosting which is a match made in heaven with anything red velvet. 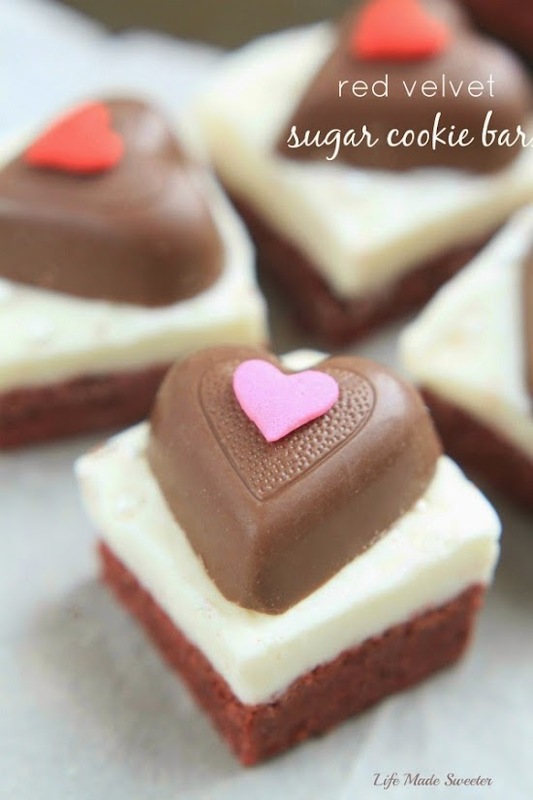 These make a special dessert for kids and adults alike and are perfect for Valentine’s Day. Add some chocolate hearts and cute sprinkles on top and you’re sure to win over anyone’s heart with these! Deliciously soft and easy red velvet sugar cookie bars with a rich cream cheese frosting makes a festive treat for Valentine's Day. Preheat oven to 350°. Line a 8x8" pan with parchment paper or aluminum foil sprayed lightly with cooking spray and leaving an overhang over the pan. In a medium bowl, whisk together flour, cocoa, baking powder, cream of tartar and salt. Set aside. In a large mixing bowl, cream together the softened butter and sugar until light and creamy, about 2-3 minutes. Beat in the egg, vanilla and food coloring until well combined. Slowly add the flour mixture and mix until a soft dough forms - do not overmix. Press dough into the bottom of the prepared pan. Bake for about 18-20 minutes until the edges start to pull away from the sides and a toothpick entered into the center comes out clean. Allow to cool completely before frosting. To make the frosting, beat together the cream cheese and butter. Slowly add the powdered sugar and vanilla. Beat until smooth. Frost the top of the cooled bars. Remove from pan and cut into squares. 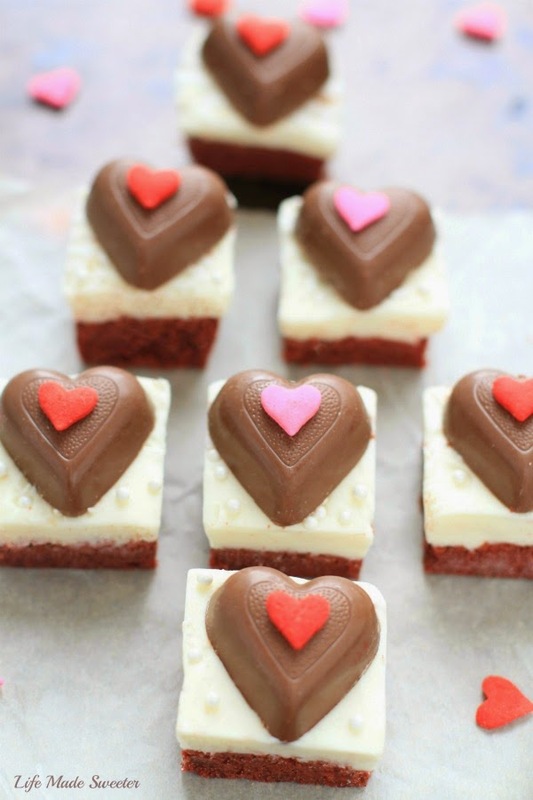 Top each square with a heart-shaped chocolate. And now for a fun GIVEAWAY to brighten up your Monday! 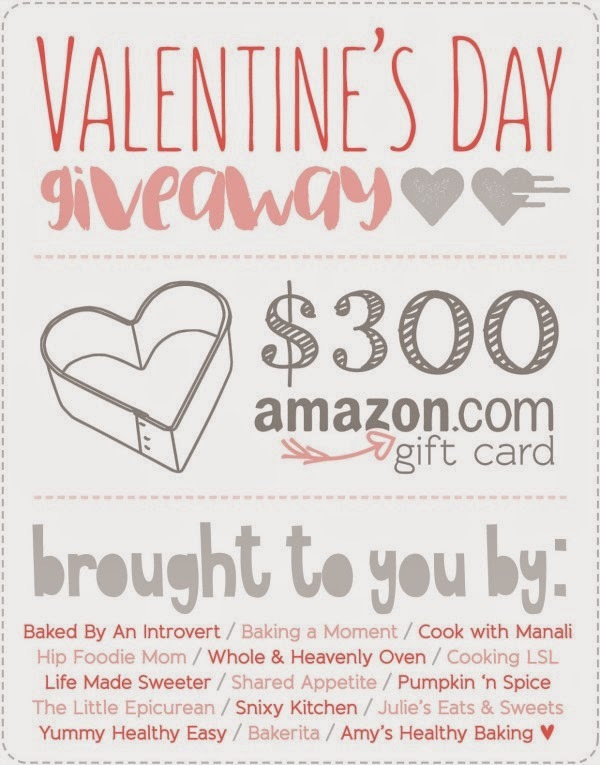 I’ve teamed up with some wonderful blogging friends to bring you a special Valentine’s Day Giveaway! One reader will have a chance to win a $300 Amazon Gift Card! Think of all the sweet gifts you could get for yourself or that special someone in your life! Just use the widget below to enter. Good luck everyone!